It may look like a long list but most of the ingredients for this tasty supper are storecupboard staples. 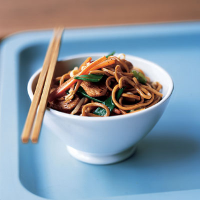 'Chow mein' literally means stir-fried noodles - this dish can be cooked in just one pan within 20 minutes. In a bowl, mix together the soy sauce, wine, garlic and ginger. Add the chicken and leave to marinate for 10 minutes. Meanwhile, cook the noodles according to pack instructions and drain. Heat the oil in a large frying pan or wok, add the chicken and cook for 4-5 minutes until browned. Add the carrot, mangetout and salad onions and stir fry for 2-3 minutes. Add the beansprout mix, noodles, oyster sauce and sesame oil and toss together for 2-3 minutes until hot. Serve immediately in large bowls. Replace the chicken with 200g peeled raw tiger prawns, which should be removed from the pan after they have turned pink, then returned with the beansprout mix and noodles.